Let us start by saying that aeration is beneficial for all lawns, no matter what its size or condition. 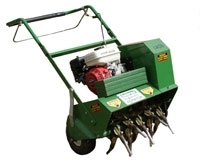 In fact all lawn experts agree that every lawn should be aerated at least once per year. Thatch is a build up of organic material creating an organic mat on the lawn. This can prevent important nutrients like water and feed reaching the root zone. In summer it impedes proper aeration and restricts the passage of much needed rain. Since water penetration through the soil is reduced but is held in the thatch layer, an environment where moss will thrive is created. The effect in autumn is serious where the thickening of the turf is inhibited and the constantly wet organic blanket encourages disease. Scarification is the mechanical process of removing this surface thatch from a lawn. It is also used to remove dead moss after treatments have been applied. The lawn may look worse after the treatment but it is an essential part of the renovation process. 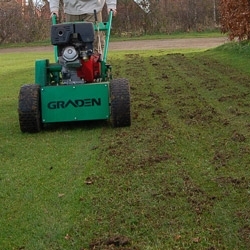 Scarifying at regular intervals promotes denser growth and helps to ensure you have a vibrant lawn. With thatch removed, air, water, nutrients, herbicide and pesticides can do their job. Turf becomes healthier and more resistant to insect damage and disease. Contact us today for a free no obligation quotation to begin your lawn revival!